If you visit any still body of water at this time of year, you can be fairly sure to see a covering of tiny green plants. Sometimes, the whole of a pond or canal will be blanketed under the leaves, as if it were a bowling green – indeed, in the Second World War some people believed that this plant was grown on purpose to disguise the waterways. What we are looking at is Duckweed, one of the smallest flowering plants in the world, a prodigious multiplier and a great source of food for ducks (hence the name), and for pond fish. 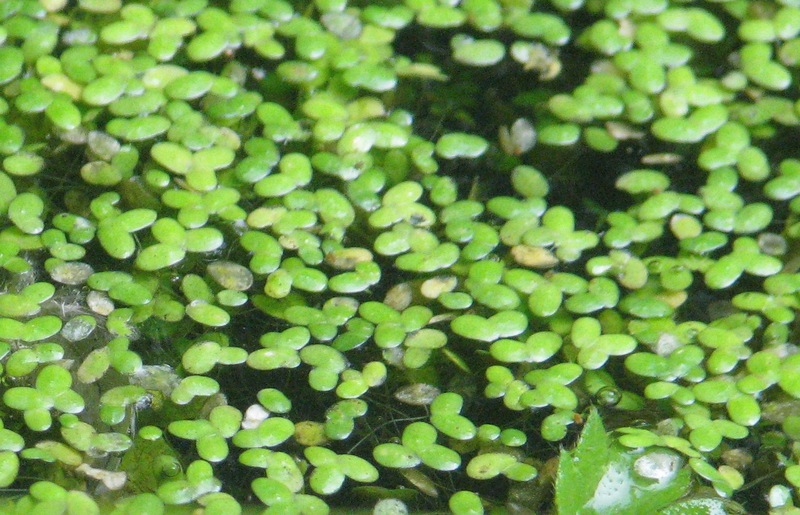 The secret of Duckweed’s ability to cover whole ponds is down to its method of reproduction. Although it can produce flowers, it generally grows by division – each cluster of leaves can split into separate plants. This means that the plant can double its size in less than five days. One of the joys of the internet is that it allows anyone, whatever their passion, space to enthuse, and so, for a lovely little film illustrating how Duckweed grows, have a look at this from ‘The Charm of Duckweed’ site (click on the link to ‘Growth’ in the second sentence of the first paragraph). Why does Duckweed sometimes grow so quickly? Well, it grows in ponds with high nutrient levels (particularly nitrates and phosphates). This gives me an indication that the falling leaves and other debris in my pond are starting to make the water a little too ‘rich’, and I should be a bit more meticulous about extracting them than I was last year. 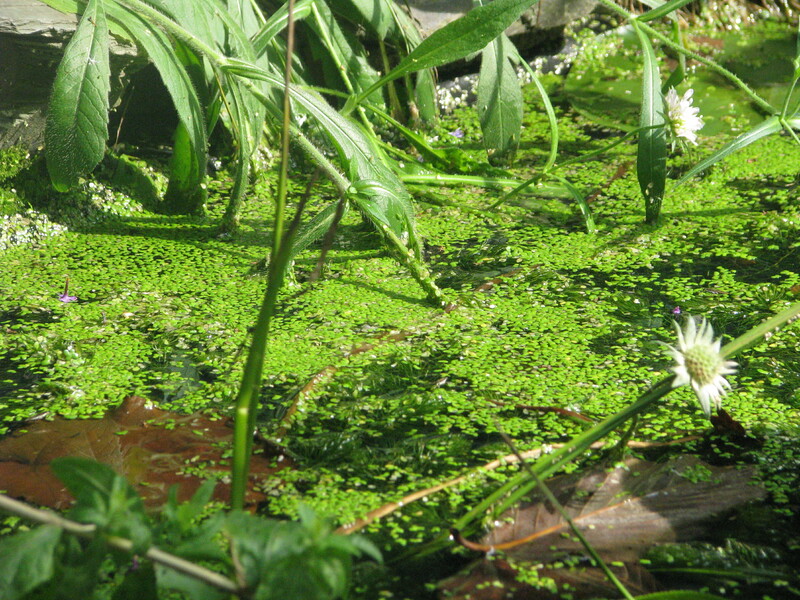 However, all is not lost – as Duckweed grows, it absorbs some of these nutrients, and so, provided I make sure that it is skimmed from the surface regularly, it’s actually a useful way of helping the pond water to become less of a stew. I always allow any plant matter that I remove to sit on the side of the pond for a few days, to allow the water creatures to return. After that, it’s excellent compost. 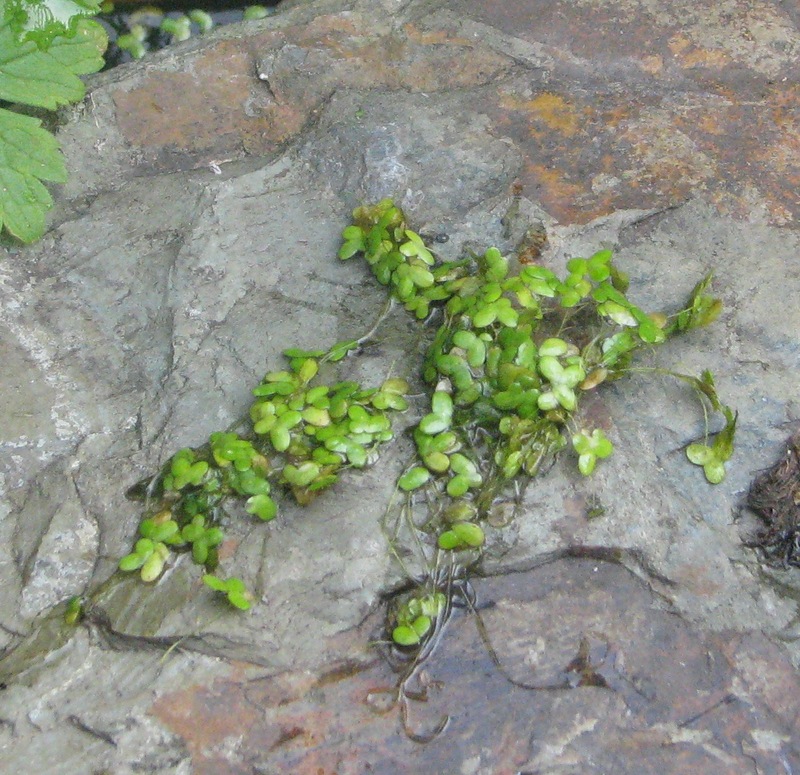 When Duckweed is removed from the water, it’s easy to see the long single roots that come from each cluster of leaves. It always reminds me a little of mustard and cress, and indeed it’s so full of fat and protein that it is grown for poultry and fish food. One question that puzzles me a little is how Duckweed ended up in my pond. As I’ve mentioned before, it is a long way from any other bodies of water. However, when I was handling the weed I found it clung to my hands despite much vigorous shaking, and so it is likely that it will do the same to the legs of any birds who drop in to drink. It probably arrived in my pond wrapped around the ankles of a passing blackbird. Although Duckweed is an annual plant, it is able to survive the winter quite comfortably. Once the temperature drops, the plant develops little starch-filled growths called ‘turions’ which fall to the bottom of the pond and spend the winter laying peacefully amongst the hibernating frogs and dragonfly larvae. In the spring, it floats back to the surface and recommences its reproduction. 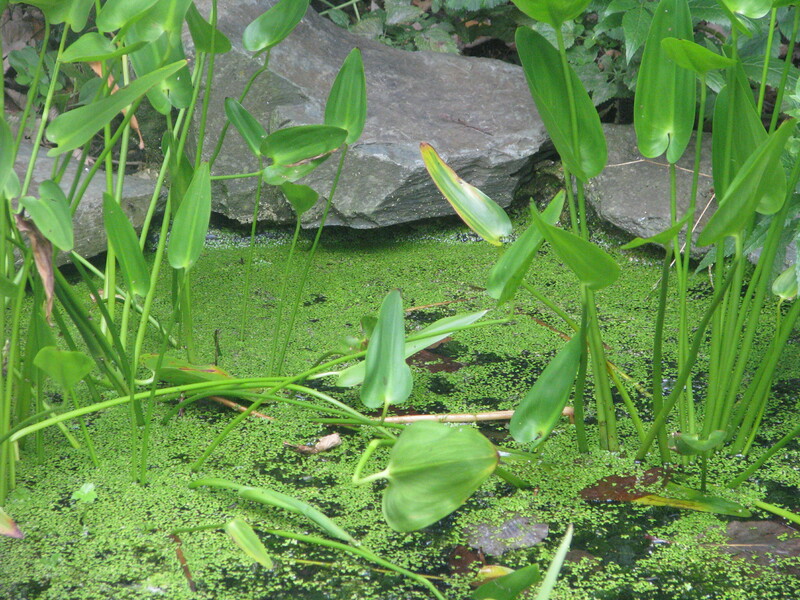 Once Duckweed has arrived in a pond, it’s very difficult to eradicate. ‘The green mantle of the stagnant pool’ (King Lear, Act III Scene IV). But the other reason is that, in previous years, I’ve spent a lot of time pulling blanket weed out of the pond. This is a thick, fibrous algae which wraps around everything, drowning insects and entangling tadpoles. This year, the Duckweed has shaded the pond to such an extent that I have no algae at all, and the water is much clearer. It’s much easier skimming off some little green leaves than pulling out great skeins of yellow-green slime. So, thank you Duckweed – as so often, a tiny, easily overlooked plant performs a big, meaty role in the ecosystem. This entry was posted in London Plants on August 27, 2014 by Bug Woman.